The day was marked with meeting new people, staying true to yourself - making certain fashion statements and of course Mozart hair. It was a very long, but extremely entertaining night, filled with fashions shows, which were divided into 3 different parts. Young@Squat opened the shows of day two. Three young designers presented a modern, fresh and eccentric collection, which I believe impressed all the fashion enthusiasts in the audience and brilliantly set the tone for all the shows that followed, just like Peter Movrin managed to do for Day 1. Julija Kaja Hrovat who was the winner of last year's Mercedes-Benz award presented her first fashion week collection, which was focused around vibrant colours, patterns, embellishments and careful detailing. Milica Vukadinovic was my favourite of the night. The entire collection was absolutely beautiful - I was again very impressed with the accessories (aka the awesome backpacks she presented). SUSNYARA presented a collection, which was a true let down. This may be a really unpopular opinion, because she is a well-established fashion designer, but I have to say it like it is. The collection didn't feel modern, inspirational, expensive or beautifully designed. It looked like a designer, trying hard to present something different, but in the end sadly failing at it. Draž presented another beautifully executed collection. They fully understand their clients and definitely design in a way that would suit their clientele. Sofia Nogard is a brand led by two fashion designers, who presented a collection right up my alley. Almost all black collection with the addition of green detailing showed us structured pieces every minimalistic lover with a passion for edginess would love to wear. Atelier Terra Urbana is an environmental-consciousness brand. The duo of designers presented an all vegan collection. It was definitely the most cohesive show I've seen on this edition's of MBFWLJ and I really appreciate the way they presented a full story on the runway. If I'm honest, I actually didn't know who they were before I've seen their show last night, but I was really impressed with their work and the message they want to spread around the fashion industry. AKULTURA presented a black&white collection, which is quite predicted colour scheme for the fall and wintertime, but a timeless combinations for us, who love to dress minimalistic. I really love the way she incorporated pleated details into the collection. Look number two was focused around a minimalistic black Janja Videc dress, which was part of her Basics by Janja Videc collection. As I've mentioned in my previous post, the theme of my fashion week outfits for the spring edition of #mbfwlj 2017 is notions of ethno and tradition. Because of that I decided to wear a dress of a Slovenian designer - to support local design and a great designer in general. If you haven't already read an interview with Janja Videc, click here. 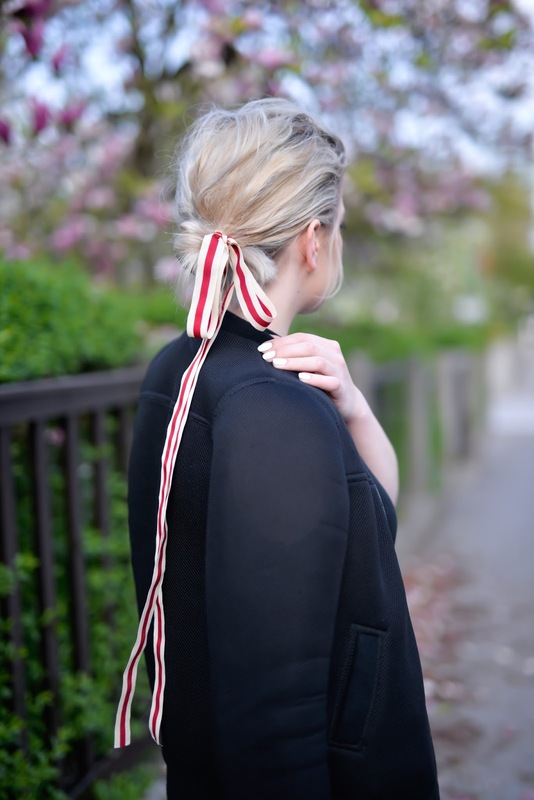 I draped a structured neoprene Topshop jacket over my shoulder and accessorised the look with a loose striped ribbon in my hair (a big upcoming trend I've talked about in my previous post), black mules and a fury phone case. Because I needed a pop of colour in this minimalistic, all black look, I put on a matte red lipstick with an orange undertone from Revlon.